Teaching music was my passion - so I bypassed music teaching jobs and started a business teaching music on my own. But then I made a music, I pulled out of the business too soon, and now I regret not staying in it for the long haul. Learn from my story, and do whatever it takes to make your business happen. 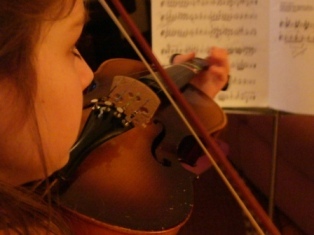 I started a personal business in my off time teaching violin lessons to children and adults. I really loved the teaching - students can be so inspiring, and there's nothing as satisfying as working with someone to accomplish something difficult and then seeing their justified pride when they achieve it! I miss that feeling; it's not one you get in an office job, like I have now. The only thing I didn't love about my teaching work was recruiting students and advertising. I'm not an outgoing person by nature, and I had a hard time forcing myself to get out there and give my business the credit it deserved. Having my music teaching business, was a lot different than just taking a music teaching job. My music teaching business required that I find a way to keep business coming my way. I was a really good teacher, and I think I didn't do myself justice in speaking with local school personnel and parent groups and in my print advertising. I kick myself today thinking about it - here I had my perfect job, and I gave it up because I was, essentially, too shy! If I had it to do over again, I'd do a few things differently. First, I'd sit down and look at what other private teachers were doing; get copies of their print ads, go to their events, and evaluate what I saw. If I could identify their strengths and weaknesses, I would be able to learn from each, and be more confident about my own approaches. I'd also remind myself daily that the initial startup is the highest-pressure time for recruiting students and advertising. Once you've gained a body of customers who know you and your work and like it, they become a de facto advertising committee. People talk to each other, and tell each other about services they have come to rely on and whose approach they admire. Finally, I think I'd set aside some time at the beginning of each day to make promotional phone calls and distribute a couple ads. If I did a little every day, it wouldn't seem like such a daunting chore. Before, I would set aside an entire day now and then to go places and speak, put ads up in local businesses and schools, and make phone calls. That was too much concentration on an uncomfortable activity. My music teaching business brought me more joy than any of the other music teaching jobs out there. And I really miss not giving it a true chance to survive. The long and the short of it is, don't do like me and give up just because you have an aversion to one part of the work. Here's to your success at finding a way to push your passion into a business! Be encouraged to keep doing your thing! If You Are Looking For Music Teaching Jobs, Then Why Not Try To Turn Your Passion Into A Business? He Will Give You All Of The Ins And Outs Of Going Beyond Searching For Music Teaching Jobs By Creating A Business That's Designed After Your Own Heart! Comments for I Gave Up Too Soon! yes you are! NEver give up cause life is your only chance to achive something more that just boring death.